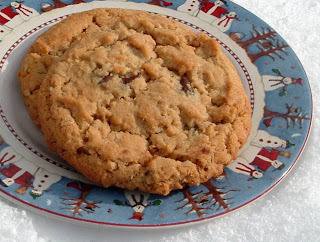 Rah Cha Chow: Oatmeal, peanut butter and chocolate chips - in one cookie! Oatmeal, peanut butter and chocolate chips - in one cookie! Yes, that's snow you see in this photo! We had quite a snow overnight -- maybe 4 inches or so are on the ground. And no, that's not a reason for a snow day! The roads are mostly clear. Whenever it snows, I feel like baking. Today I decided to make cookies that combined oatmeal and peanut butter -- with chocolate chips thrown in for good measure. This is my favorite cookie recipe on allrecipes.com.... I have taken suggestions: Add 1tsp Van., use 1 1/2 c. flour, use 2 c. oatmeal, 1c. chunky PB and 1/2 c. creamy. They also taste incredible with white chocolate chips added. That cook sure did make a lot of changes to his/her favorite recipe! In the world of cooking contests, if you've made three or four changes to a recipe, it is considered to be a different recipe. I did make several changes and boy, were they yummy -- chewy, peanut buttery, chocolaty -- the boys will love them with hot chocolate when they get home from school! This time of year there are lots of blogging events related to holiday baking. This one is going to Joelen's Culinary Adventures for her holiday cookie swap blogging adventure! Check her blog sometime after December 7 for lots of other cookie ideas! In a large bowl, cream together shortening, margarine, brown sugar, white sugar, and peanut butter until smooth. Beat in the eggs one at a time until well blended. Combine the flour, baking soda, and salt; stir into the creamed mixture. Mix in the oats and chocolate chips until just combined. Drop 1/4 cup ice cream scoopfuls onto ungreased cookie sheets. Bake for 17 to 19 minutes in the preheated oven, or until golden brown on the edges. Don't over-bake. Let cool for two minutes on the cookie sheet, then put on cooling racks to finish cooling. Store in an airtight container. How could you possibly go wrong with the trifecta? Wow. I love seeing all these cookies. I want your dog! They do look super yummy! Send some snow or at least cooler weather down to Texas we're still in the 80's! Crap, girl! I think I typed my email where my "name" should have been on my "Charlie" comment for this post. Can you change it? Or delete the post? I didn't mean for my personal email address to get posted! Shannon, I'm sorry I didn't notice your email address on there. I deleted the comment ... and I'm glad you liked the pic of Charlie! I cracked up when he licked his mouth just as I was snapping the picture!